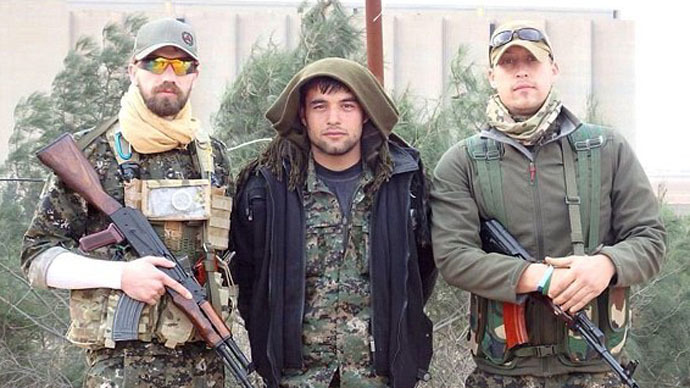 Jamie Read is one of two British ex-soldiers who joined the Peshmerga in November last year. He served in the army for four years before leaving to join the conflict in Syria. Having returned home in December 2014, he has already said he would consider rejoining the fight, despite receiving death threats from militants. Speaking at an event organized by a private security firm – which trained Read in self-defense and tactical fighting before he left for Syria – he said that assumptions of the Islamic State (IS) being a structured and organized territory were inaccurate. “All the stuff about IS being organized is not what I saw, they seem like office workers and villagers who were simply pointed in the right direction and told to get on with it,” he said. “They are ordinary civilians from various places involved in the conflicts who have to fight. They do not have a choice, and they don't have any information, or even any clear leadership. Many of them are heavily involved in taking drugs they are so terrified,” he added. He also revealed that the Peshmerga are not a disciplined fighting force. “I tried to pass onto them some of the basics of military tactics, but they were not interested, because it was in conflict with their ideology,” he said. The former solider said the £250,000 bounty on his head would not stop him returning to fight. He also acknowledged his actions had made him a target. Read, 24, travelled to Syria with another man, James Hughes. The pair were accused of being paid mercenaries in November, after it was revealed they had flown to Syria to aid in the battle against IS extremists. After their flight home for Christmas to visit family, the two men were held at Heathrow Airport for six hours, where they were kept in separate rooms and questioned about their activities before being released.